GCFC Member, and local filmmaker, Johnny Wu will premiere his film Innerself on Saturday, May 12th at 8:00 pm at Atlas Cinemas Lakeshore 7! 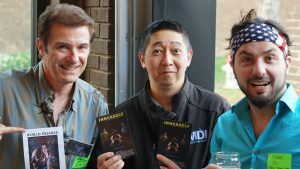 (Left to Right) Donn Nottage, behind-the-scenes video on “Innerself”; Johnny Wu, GCFC Member & Writer/Director of “Innerself”; Mikhail Tot, cast member of “Innerself” at the GCFC Media Mixer on May 2. Johnny has been involved in the Cleveland film community since 1998 (the same year the GCFC was founded). He has seen it grow firsthand, and sees Cleveland as a real hub for Hollywood filmmaking. As an independant filmmaker, Johnny has learned a lot about working in the city with fellow filmmakers. He appreciates local businesses providing their support and opportunities for local film. Johnny has always been focused on giving back to his community, which is why he became a member of the GCFC, and he encourages other local independent artists to do the same. Click HERE to become a GCFC Member like Johnny, and support film in Cleveland! Innerself is a martial arts, musical comedy that follows Ed, a naïve young man who has been bullied his entire life, and finally decides to do something about it. He studies martial arts, develops into an expert fighter and begins fighting everyone – from his bullies to his sensei. Kicked out of school for fighting unnecessarily, Ed struggles to become a better man. Meanwhile, his new sensei is attempting to take over his former school and is using Ed to do it. More information on the screening HERE.